On the way back to Jerusalem in the morning, the fruitless fig tree Jesus had spoken to had withered. It didn't wither when he spoke to it, nor did it wither later that day (the disciples didn't remark on it as they returned to Bethany in the evening). But now, a day and a night later it has withered from the roots. Whether or not there is significance in the timing, Jesus explains that faith results in answered prayer. He also mentions the need for forgiveness; perhaps he is saying that in speaking over the tree (which is an emblem of Israel) he also forgives them for their lack of fruit. He expects fruit and in that sense Israel has failed and must wither like the fig tree, yet she is forgiven, not forgotten. How often do we, too, fail to produce the fruit that is expected of us? This is a lesson for us all, not only for Israel. We need forgiveness because of our failure to produce good fruit. But we must still understand the cost of fruitlessness. What we have done in our own strength and according to our own wisdom will eventually wither away. Elsewhere Jesus tells his followers to lay up treasure in heaven where it will last forever (Matthew 6:14-21). 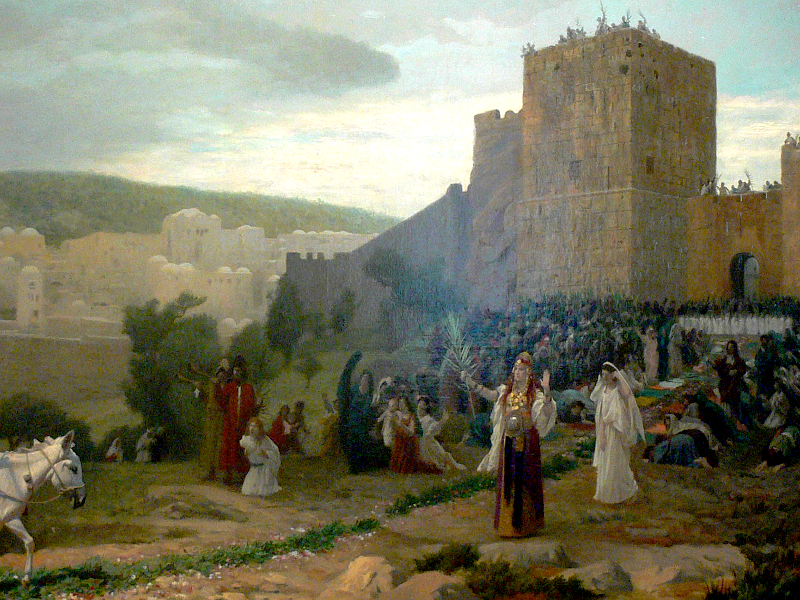 Back in Jerusalem again, Jesus returns to the temple courts where his authority is challenged. This is a question containing a trap. If he tells the truth and says 'from my Father in heaven' they will accuse him of blasphemy. So he replies with a hard question of his own, a question that also contains a trap. They will not answer, so neither does he. But we often overlook the truly extraordinary in our eagerness to understand the mundane [Tweet it!]. What is truly extraordinary here? It's this - the Creator of the universe (The Author of existence) is being asked where his author-ity comes from. Mere men who have usurped authority as the leaders of Israel are rudely demanding to know the source of his authority to speak and act. And he listens to them and converses with them. The fact that he defuses their barbed questions is not surprising, the fact that he deals with them as one man to another is truly astonishing! And he treats us in the same way, face to face, in conversation, as equals even though nothing could be further from the truth. We could never attain the stature to converse with him, so he comes down to converse with us, and love us and make himself known to us. What a King we have in Jesus! Immanuel, Elohim with us and amongst us! Labels: Fruitfulness, Mark, Who is Jesus? Just a few days before the Passover festival, Jesus and his disciples approach the city and spend several days there, returning each evening to Bethany where Mary, Martha and Lazarus live. It's very likely that Jesus and the twelve stayed with them as they were particularly close friends. In Mark 11:1-19 we have an account of the first two of these days. Before they reached Bethany and the nearby village of Bethphage, Jesus sent two disciples ahead to collect a young donkey, and he rode upon it as they entered the city of Jerusalem. The crowds cried out 'Hosanna' (save us) and used other words from Psalm 118:25-29. Jesus spent some time looking around in the temple, but then he returned to Bethany as it was getting late. In the morning, on the way back to the city, he spoke to the barren fig tree. It represents an equally fruitless Israel. Arriving in the temple courts again he throws out the traders he had seen the previous day. And the chief priests and law teachers were afraid of him and decided to kill him. In the evening they returned to Bethany. Do you see the deep significance of all this? Jesus arrives to a modest welcome when the entire nation should have been there rejoicing at the coming of the Anointed One [Tweet it!]. He comes to his own and the great majority of them don't recognise him or welcome him. He enters the temple, raised to glorify the Father, and he sees that it's become a money exchange and shopping mall. The next day he returns to purify the place and on the way speaks to the fruitless fig tree. an emblem of Israel. And the nation's leaders want to kill him. The scene is set for what appears to be the last act. But it's only the ending of the first half. After an interval of three days the action will begin again when he rises from death and starts a spiritual revolution that nobody expected. Truly he is the One who was promised! Mark 10:32-52 - Greatest or least? It seems that despite all they have seen and been told in Mark 9 and the first part of 10, the disciples still struggle to grasp the idea of a back to front kingdom. In Mark 10:32 there's a clear distinction between disciples, followers and the Twelve. The disciples are astonished and the followers are scared while the Twelve get extra information. It seems that the bulk of the crowd (perhaps all of them) are followers. They tag along because they want healing for themselves or someone they know, they want to hear a great teacher, or they want to witness the healings and other miracles. They are hangers-on. Disciples are more serious followers who believe what Jesus says and want to know more so that they can follow more fully and more closely. They are people who want to see and hear for the purpose of better following, not merely to see wonders. And the Twelve are chosen, they're called to follow and they get additional teaching and guidance. They are apprentices. Within the twelve we can distinguish three who are in the innermost circle - Peter, James and John. And perhaps we might even say that John, the 'disciple that Jesus loved' was closest of all. Jesus tells the three closest to him that he is going to die in Jerusalem and that he will rise after three days. How disappointing, then, that two of them (including John) ask to sit beside him in his glory! They still don't understand that in order to be great in the kingdom they must give up all status, all power, everything involving self or glory or privilege [Tweet it!]. Here is Jesus in his last few days of ministry, having just explained this very point in the immediately preceding days. And they still don't see it! Having explained this critical fact again to all twelve they arrive in Jericho. And here Jesus heals Bar Timaeus of blindness. He has just told James and John that he cannot choose who will sit next to him. Now he shows that he will pour out healing on those with the faith for it. It's all about seeing. Bar Timaeus sees, but even at this late stage James and John do not. The current theme (see notes for 18th and 19th December) continues in chapter 10, Jesus is still focussing on the kingdom's back to front nature and the need for his followers to imitate him in choosing the path of humility, emptiness and weakness [Tweet it!]. In Mark 10:1-12 we again see Jesus deliberately contrasting kingdom living with the Law. He answers the Pharisee's question by explaining that the Law exists because of hard-heartedness. Jesus is the Way, the Truth and the Life and he sets us free. If we always walked as he does, spoke as he does and lived as he does we would always go beyond the law. By bringing ourselves low and serving one another in our marriages we would avoid the need for any law about divorce. And in Mark 10:13-16 Jesus again refers to the value of a childlike nature. Young children are inherently trusting, dependent, and straightforward. They are never puffed up with self-importance. Finally, in Mark 10:17-31, we see the need to become less dependent on physical wealth too. Jesus doesn't mean we should all live in poverty. He is showing us that nothing we have should be more important to us than he is. If our wealth prevents us obeying him and following him we would be far better off without it. The same is true for everything that has value to us. Let it go, it cannot offer you eternal life. It should not be more important than Jesus, if it is it had better go. Whether we think in terms of law, maturity or wealth, we need to cling to it less and learn to cling to Jesus instead. He is our righteousness. In Mark 9:30-50 we get to share in some more of the teaching Jesus gave to his closest followers, the Twelve. Last time we saw Jesus in relationship to five powers and to his disciples; this time we see the greatest secret of his kingdom, something that confuses and ultimately defeats all five. For those who are in the kingdom and know the secret, everything is transformed. The secret is that everything is back to front. The weak are strong, the hungry are filled, the lost are found and death brings life. If the disciples follow the pattern of the five powers they will fail, so Jesus teaches them about the 'back to frontness' of kingdom living. Notice in verse 30 that he wants time alone with them. He needs to get them away from distractions that will prevent them paying close attention. He begins by telling them that he will be killed and will rise. Although they don't understand, they will remember this later. The death of Jesus at the hands of the religious and civil authorities is the heart of the kingdom. It is 'back to frontness' at its most extreme. We need to see this for ourselves. It is the greatest possible example for us that the One with ultimate power, the one who created the entire universe, would choose to die. Why? Because through the death of the One will come life for the many. Jesus knew their hearts, and he knows mine, and he knows yours. They were arguing about which of them was the greatest. If my ambition is to be first I had better choose to be last and least. It's the way of the kingdom and the way of the King [Tweet it!]. He said, 'I am the way'. He illustrated the principle of being least by referring to a small child. Nor should we be concerned about others doing what we are doing. It's not a competition. If we are doing kingdom work and they are doing what we are doing then they are doing kingdom work too. Let them be. Nor should we ever cause others to stumble. And we are to get rid of whatever brings about our own stumbling. Mark 9:1-29 explains how Jesus appeared in glory to just three of his followers - Peter, James and John. These three were special friends, the inner circle. It was a privileged but frightening experience. Peter always had something to say and on this occasion he just came out with the first thing that crossed his mind. He treats Jesus with the same honour as Moses and Elijah who represent the Law and the Prophets, but the voice from the cloud makes it clear that Jesus, the Son, has the pre-eminence. 'Listen to him' implies 'more than to these' or even 'listen only to him'. The Messiah is the fulfilment of the Law and the greatest of the Prophets; he exceeds both as the sun exceeds a candle. In following him up the mountain, we need to recognise his awesome glory and majesty. He will reveal great and astonishing things to us, but we can't comprehend how far beyond all of them he truly is. Returning from the high mountain, they find a bit of a commotion going on. Surrounded by a large crowd, the other nine disciples are having a loud argument with the religious leaders. As soon as the people saw Jesus they ran to him in wonder. This is just as true today as it was then; whenever people truly see Jesus they are filled with wonder and run to him. We can point people in the right direction; we can tell them the stories about the things Jesus did and said; we can tell them how he affected our own lives. But only the Holy Spirit can reveal the living Messiah to a person. And when he does and they see for themselves they always run to him in wonder. The argument was about a difficult demon that the disciples had failed to cast out. The accepted way to cast out a demon was to ask its name and then use the name to eject it; clearly this cannot be done when the possessed person is mute. But Jesus doesn't need standard methods and does not need to know the demon's name. Although he says that prayer is essential for this kind of demon, he simply commands the demon to leave. This truly demonstrates his power to the crowd, to the disciples and to the religious leaders too. Nobody can find fault with him. But if the disciples are to deal with a dumb demon they will need to pray and perhaps fast as well. Then they must command the demon to leave in Jesus' name. Notice how, in these twenty-nine verses, we see Jesus in relationship with the Law, the Prophets, the religious authorities, the disciples, the world, and the demonic forces. He is greater than all of them, but only his disciples are invited and commanded to join him in his work. Do we really understand what a privilege that is? Labels: authority, Mark, Who is Jesus? Jesus just points out again that they are trying to kill him and that's not something Abraham would have done. So now they protest that Elohim himself is their only Father. 'In that case', Jesus tells them, 'you would love me because Elohim sent me.' And he tells them plainly that their father is the evil one. They now claim that he is a demon-possessed Samaritan. They stand before the Mighty One in human form and declare him to be demon-possessed! Eventually he stops them dead in their tracks by saying, 'Before Abraham was born, I am.' These words were not only nonsense to them, they were also blasphemy ('I am' sounds like 'Yahweh', the Holy Name that may not be spoken) and they started to pick up stones. But before they could throw them, Jesus had slipped away and disappeared into the crowd. Jesus, the Son of the Most High, has come among them and spoken with them; yet they reject him! [Tweet it!] He explained clearly and straightforwardly who he is, and they tried to stone him. Although the time for crucifixion has not yet arrived, they already hold in their hearts the intention of killing him. Quite simply, they don't believe him. They don't believe he hears from the Father. They don't believe he is a Jew. They don't believe he is demon-free. They don't understand him or hear him or obey him. They do not believe he is greater than Abraham. They don't believe Elohim is his Father. They don't believe he has seen Abraham. They don't believe he is the Son of the Almighty. Labels: Jesus rejected, John, Who is Jesus? John 8:21-38 - Who is Jesus? Today we are reading John 8:21-38 together. The religious leaders in Jerusalem have been wrestling with the things Jesus has been telling them, and so far they have failed to understand what he means. And now, speaking in the Temple treasury, he tells them that he is going somewhere, that they will die in their sin, and that they won't be able to follow him. Once again they are puzzled as well as angered. They want to know who he is. It's an important question for us, too. Some of them do believe, and to these he says that the truth will set them free. They are puzzled again because they believe they are free, and they claim Abraham as their father. So just what can we learn from this short passage about who Jesus is? Here are some of the main points. Verse 20 - He is a teacher and his hour has not yet come. 21 - He is going somewhere and the Jewish leaders cannot follow him. 22 - He is an enigma. 23 - He is from above, he is not of this world. 24 - Those who believe his claims will not die. 25 - He consistently tell us who he is. 26 - He speaks judgement and tells us what he hears the Father say. 27 - He confuses the wise. 28 - He will be lifted up by the Jewish leaders; he is the Son of Man; he does nothing on his own; he speaks what the Father teaches him [Tweet it!]. 29 - The Father is with him; he is not alone; everything he does pleases the Father. 30 - Many believe in him. 31 - He has followers and teaches the truth. What a Lord! What a King! Labels: John, Who is Jesus? John 7:53-8:11 is not included in the earliest manuscripts of John. This section may have been recorded or remembered from a real event, but added later. It is certainly a powerful expression of forgiveness and a great example of the action of grace as opposed to law. In John 8:12-19 we see that as usual, the Pharisees are not happy when they hear Jesus' teaching [Tweet it!]. He uses the phrase 'I am' which in Hebrew sounds very much like the Holy Name that must never be uttered except once each year by the Chief Priest when he entered the holiest place in the heart of the Temple. Jesus is either saying that Yahweh is the light of the world (using the forbidden Name), or he is saying that he, himself, is. That would also have seemed an outrage to them. Either way they would have been utterly horrified by the statement. Yet both forms of the sentence are true! The Father and the Son are one as also is the Holy Spirit. Together they create light and illuminate the hearts of all who have eyes to see and will follow. Anyone who follows Jesus will have this 'light of life'. This is not the first time Jesus used the words 'I am' in this way, nor is it the last. As so often, Jesus is speaking spiritual truth when the Pharisees are trying to understand things in a worldly way. They are concerned that he seems to be undermining their authority and so they miss in every sense the evidence that he is the Way, the Truth and the Life. We need to be tuned in to the spiritual meaning in everything Jesus does and says. Before starting to read and discuss Matthew, here's an overview of the book and its author. The book - Matthew's gospel was written by a well-educated Jew, probably between 60 and 80 AD [Tweet it!] (thirty to forty years after the events he describes). It seems certain he used three sources; these were Mark's gospel, the text of an earlier account that scholars call Q, and probably his own memories and those of his friends. This gospel is focussed on Jewish traditions and people, and generally draws on a broad and deep understanding of Jewish society and customs at the time of Jesus. It was probably written for the Jewish diaspora living in Alexandria, Antioch and elsewhere, Jews who would have spoken Greek in everyday life. The structure of Matthew closely follows that of Mark with the addition of extra material at the beginning (the genealogy and stories of Jesus' birth) and at the end (events after the resurrection). The purpose of the book is to reveal Jesus as the Messiah, of the royal lineage of David, and the fulfillment of the Jewish scriptures. Matthew is also clear that Gentiles are included. The author - The book may have been written by Matthew the tax collector (also called Levi), one of the twelve apostles. Certainly this is what the second century church fathers thought. The text itself suggests that the author was fluent in Greek with a good knowledge of either Aramaic or Hebrew (or indeed both). What can we learn from this part of Mark 8? Jesus is happy to heal the blind man, but he leads him away from the village first and afterwards warns him to not even go into the village (Mark 8:22-26). In the next section, when his disciples declare that he is the Messiah, he warns them not to tell anyone about him (Mark 8:27-30). In Mark 8:31-33, we see that Jesus is well aware of what will happen to him in the end. He speaks plainly about it. And his criticism of Peter is based on the fact that he's not thinking in terms of pleasing the Father but wants to please people. And finally, in Mark 8:34-38, he explains to both the crowd and the disciples that all his followers will need to lay down their own lives just as he is preparing to lay down his. If we are ashamed of the Messiah, he will also be ashamed of us [Tweet it!]. What was in Jesus' mind as he made these remarks? Knowing that he had a job to complete, he wanted to avoid becoming too conspicuous too soon. If he had been arrested before the right time, perhaps the disciples would have failed to understand what was happening and why. There would be a right time to be arrested, but that time had not yet arrived. The care and compassion of Jesus is displayed again when he feeds the hungry crowd (Mark 8:1-21). They haven't eaten for three days and he knows the journey home will be too hard for them, so he shares out the seven loaves and a few fish that the disciples have at hand. Bread must have been on the disciple's minds after this, but not in the right way. When Jesus uses the idea of yeast to warn them about the Pharisee's teaching and the politics of Herod, they are puzzled and wonder if he's criticising them for not bringing enough bread for the journey. He reminds them that the quantity of bread they bring is not an issue. And we are just the same! We get engrossed in worldly issues and worry about those instead of trusting Jesus to supply all our real needs. We talk about football and music and terrorism and the economy, but we forget that Jesus is the Way, the Truth and the Life. Our minds and hearts are focussed on the wrong things. There's nothing wrong with football or music, and terrorism and the economy are important issues. But having Jesus at the heart of our thinking and speaking and doing should come first. If we are going to be affected by yeast, let it be the yeast that produces the bread of life. In Mark 7:24-37 we see that Jesus is willing to help gentiles as well as Jews. The thing he requires is correct faith, not correct nationality. Jesus and the disciples were in the region of Gennesaret, on the north-west shore of the Sea of Galilee. But now they head for the the Mediterranean coast near Tyre and Sidon (today in southern Lebanon). Perhaps they wanted to be away from the crowds for a while (Mark 7:24). Try to imagine the situation. Jesus and the disciples have been walking all day; they are tired and dusty with aching feet, probably hungry and thirsty as well. They have been dealing with relentlessly pressing crowds of Galilean Jews and arguing with critical Pharisees. They have made a tiring journey to get away from all that, perhaps just for a day or two. They want to gather their thoughts and rebuild their strength through a little rest. Perhaps Jesus needs to spend some time teaching the disciples and explaining things they have not understood. And now this Greek woman appears, almost immediately on their arrival! She has come to plead with Jesus to cast out a demon that is harassing her little daughter. And when Jesus tells her that the Jews should have what they need before others, her persistence in faith and her humble but assertive answer was the key to his compassionate heart. Her faith is such that he doesn't need to go with her and see the child. She goes home alone and finds her daughter already free. Jesus and the disciples head back towards Galilee and into the Decapolis ('the ten towns', another Greek region). And there they ask him to heal a deaf man who can barely speak. Jesus doesn't want to do this in public. He takes the man and his friends away from the crowd to heal him. He sighs deeply. And he tells them not to talk about this healing. They are excited and keep chattering about it, and the more he tells them to stop the more they do it. Jesus' heart is so open and caring that he gives and gives and gives of himself way beyond what we would see as reasonable. Where there's a need, he meets it, for anyone who asks in faith and expectation.